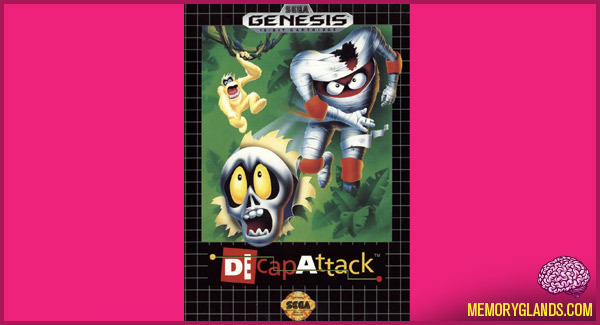 DecapAttack is a video game for the Mega Drive/Genesis console. The game is also a part of the Sega Genesis Collection (Sega Mega Drive Collection) for the PlayStation 2 and PlayStation Portable and Sonic’s Ultimate Genesis Collection (Sega Mega Drive Ultimate Collection) for Xbox 360 and PlayStation 3. It is almost identical in terms of gameplay to the Japanese title Magical Hat Flying Turbo Adventure. However, the graphics, characters and level designs were nearly all changed, since Flying Turbo Adventure was based on the anime series Magical Hat for which the license was not obtained outside of Japan. Both are updates of the Master System game Psycho Fox, and also the NES game Kid Kool.